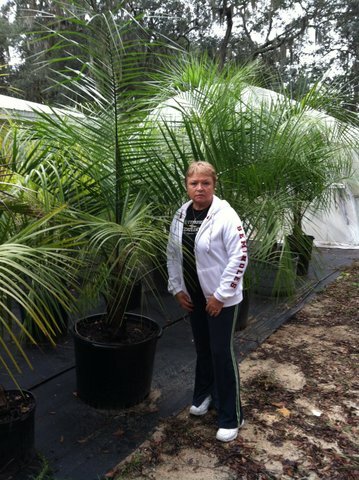 Moultrie Palms is Florida’s premier cultivator of frost-hardy, pinnate-leaved palm trees. Our unique, attractive mule palms make a fine addition to gardens, backyards, tropical environments and more, and there’s no better name in the industry for those in search of these fine trees. Frank and Elaine Lewis started Moultrie Palms in 2002, cultivating hybrid mule palm trees on their two-acre property in St. Augustine, Florida. In the years since, Moultrie Palms has grown into a renowned source for seedlings, which growers can then transport to their own properties to begin enjoying years of beauty from these fast-growing, extremely hardy trees. Developed by crossing the Syagrus romanzoffiana with the Butia capitata in Saint Augustine, FL, Moultrie Palms’ hybrid mules are very durable, and customers can anticipate a high success rate with their seedlings. We are a hybrid mule palm nursery in St. Augustine, Florida. We’ve been serving customers in Florida and beyond since 2002. We’re respected members of the International Palm Society and enjoy networking with others in our field. Our seedlings grow into sturdy, durable and aesthetically pleasing trees. Our prices are fair and our commitment to customer satisfaction is unwavering. People also buy from all over the world.